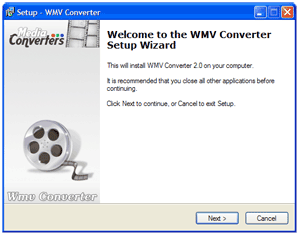 Due to the way conversion software works, Wmv Converter can to be installed, or you can run it as a stand alone exe. Output Quality - Choose one of quality presets/bitrates. 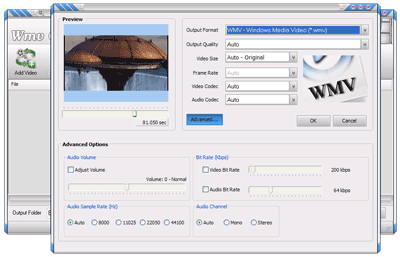 Frame Rate - Choose a playback frame rate for resulting WMV video. Advanced Settings - For greater control over wmv compression click on Advanced Settings button. 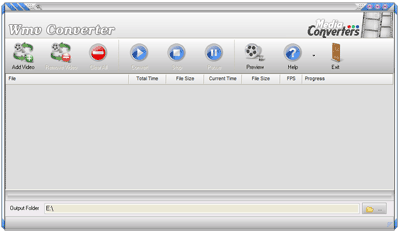 There you can override the audio volume and adjust video and audio bitrate and audio sample rate. A preview area allows you to scrub through selected imput video file. To convert a video press the "Convert" icon. At any time you can pause or stop converting. If you turned on a "Previw" option you can watch a video as it is being converted..
You can import multiple video files for converting to wmv, they will be queued in the listing and ready to be converted with their assosiated settings. Right click on a queued video for additional options. Should you have any questions please Contact Me, I will answer as time permits. 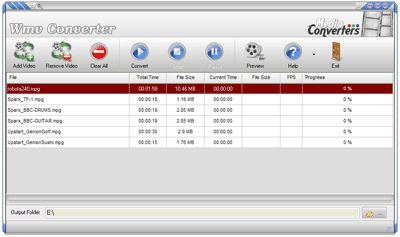 If you find this software useful please put a link to it on your website or blog so it can reach more users.